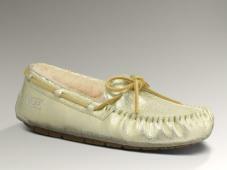 The Womens' Dakota metallic is a moccasin inspired indoor & outdoor slipper, perfect for all day wear. A moulded rubber outsole allows for flexibility & durability. Offered in the finest metallic finished leather, it is fully lined in top grade sheepskin. Leather lace detailing and precision stitching make this popular slipper as stylish as it is comfortable.